Caught when he tried to join the Norwegian exile forces. Survived some of the most notorious death camps. In April 1940, 16-year-old Norwegian Alf Knudsen watched how German soldiers entered the square in his hometown Son. The occupation had begun. Alf and his friends Kristian Sjøvold and Erling Johansen had heard that the Norwegian exile government in London was encouraging young men to go to England and join the Norwegian troops. They decided to give it a try. If the boys would just reach safety in Sweden things would work out. In September 1942 they tried to cross the border but were caught in a control as “Schwedenfahrer”, a German expression for Norwegians that tried to pass the Swedish border. Alf was sent to “No. 19”, Oslo’s head police office and prison, now controlled by Gestapo. Alf was beaten and tortured by the guards. Within a month he was sent to Grini prison camp outside of Oslo. After six months at Grini Alf gets the dreaded news: he’s being transported to Germany and the concentration camp Sachsenhausen. At first he was placed in a quarantine camp where the prisoners were put in hard work. Alf had the strange task of preparing new boots for the SS-guards, by walking in the boots in a circle for 12 hours every day. After a couple of weeks Alf was moved from quarantine to the big camp, now sticking together with the Norwegian prisoners. Forced to work in a DAW-factory, putting together various mechanics and weaponry. By the end of 1943 Alf became sick and was placed in the camp hospital. Something everyone was afraid of; to become ill often led to more illness. But Alf got better. 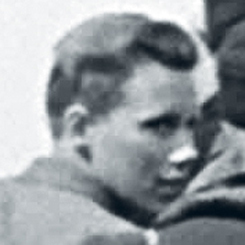 Much thanks to the young Norwegian woman Wanda Hjort who smuggled food and medicine to him. By winter 1944 Alf was thrown in a boxcar and sent to the Polish concentration camp Majdanek. Surviving the terrible five day trip without food or water. In Majdanek he was in the company of the notorious SS-soldier Anton Thumann. One day Alf witnessed Thumann killing a child with his bare hands. Alf remembers how he learned how to turn off his emotions in order to survive. As Soviet forces were moving closer to Majdanek Alf and 1200-1300 other prisoners were forced on a death march towards Auschwitz. Only 681 prisoners survived the march to Jacubowice station. Alf and the other survivors arrived in Auschwitz in July 1944. Alf got an inmate number tattooed on his arm, nr 190515. At this point he had an infection in his leg, but couldn’t get any medical care. To avoid being sent out for hard labor Alf managed to hide in his bunk. As his leg had gotten better the Eastern Front was approaching rapidly. Alf was once again sent forward. This time around to Buchenwald concentration camp south of Berlin. Alf and the Norwegian prisoners were sent there to work at IG Farben’s chemical factories. Companies like German Ford and BMW also had large factories outside the camp, that sustained the German war machine. However, Alf and his friend Trygve Grødem befriended a Norwegian student who had obtained an administrative post in the camp. He helped them to get jobs as handymen around the camp. As such they were able to move around relatively unguarded. Red Cross packages had started to arrive by now and Alf was getting better. In the beginning of 1945 Folke Bernadotte and the Red Cross had negotiated a deal with the Germans to bring home the Scandinavian prisoners. So, in February Alf was brought to Neuengamme outside Hamburg. There he met up with the long lost Norwegian friends from Kristian Sjøvold and Erling Johansen. Kristian was in a terrible state. By a miracle he had been picked out from the line to the gas chambers in Auschwitz. Eventually the Norwegian boys got places on the Red Cross transports heading for Sweden. 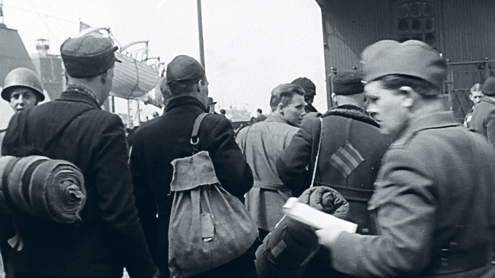 On April 28 1945, Alf arrived in Malmö. After a hot shower and clean change of clothes he was taken to Haga, outside Växjö. He and the other Norwegian survivors stayed for a couple of weeks and left for home on May 7, the day when Norway was liberated from the Germans. In the autumn of 1945 Alf was called up for military service in Norway. The officer who was responsible for the enrollment asked him, “What have you done during the war, young man?”. “I’ve been in concentration camps for almost three years”, Alf replied. “Then you are free to go back home again. You have served enough”, the officer said. After the war Alf went back home to Son, he married Signe and they had two sons. For 30 years Alf chose not to talk about his experiences, as they were too painful for him to bring up. But he changed his mind, and in 1995 Alf went back to Auschwitz and Sachsenhausen to talk about his experiences from the war. This was the first but not the last trip. Today Alf has done more than 100 educational trips to the camp sites. 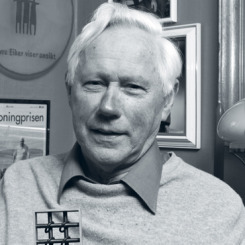 In 2010 journalist Øystein Franck-Nielsen and Alf released a book about his experiences called “Fanget – tre år i Hitlers dødsleire” (Gyldendal). If you can help us with further information about Alf Knudsen we will be very happy to hear from you. Please write an email to our researcher Sebastian. A glimpse of Alf Knudsen arriving in Malmö harbour, April 28, 1945. In the middle of the picture, wearing a grey jacket. Record from the prison at Møllergata 19 in Oslo. 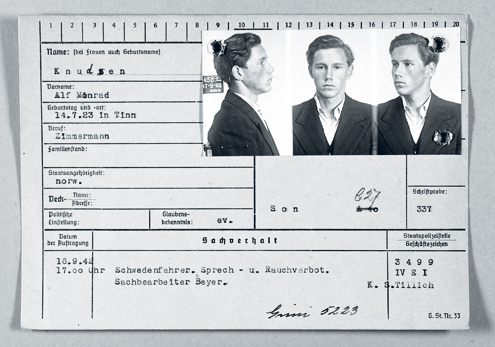 Alf Knudsen was written down as “Schwedenfahrer”. A person who tried to cross the border to Sweden. 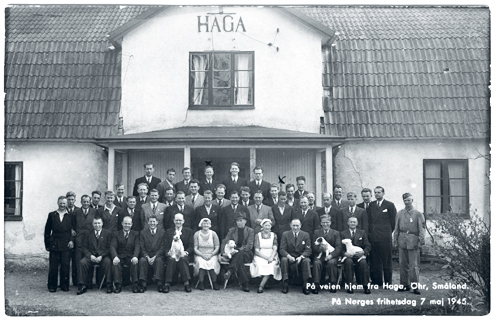 Alf with a group of Norwegian survivors in Haga, Sweden. On the day of their departure back to Norway. May 7, 1945. The day when Norway was liberated from the Germans. Alf is number six from the right in the second row. 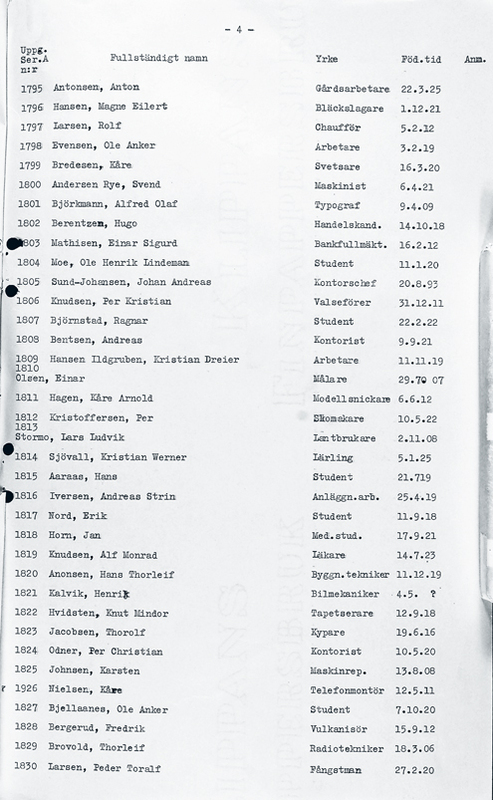 Alf’s name in the passenger list from the arrival in Malmö harbour on April 28, 1945.